The Athenaeum Club is one of several Davidson women’s book discussion groups, and although its date of founding is unknown, the Davidson College Archives holds materials on the club dating from the early 1950s until 2013. According to the club’s 1952 Constitution and By-Laws, the purpose of the Athenaeum Club is “to promote fellowship and mutual improvement of the members through the study and sharing of ideas.” Members would routinely select two books to host discussions for each year, and for the 1965 – 1966 year, members selected a theme of Culinary Customs Around the World – when a member would host a book discussion, they would also make a few dishes from a country or region of their choosing. 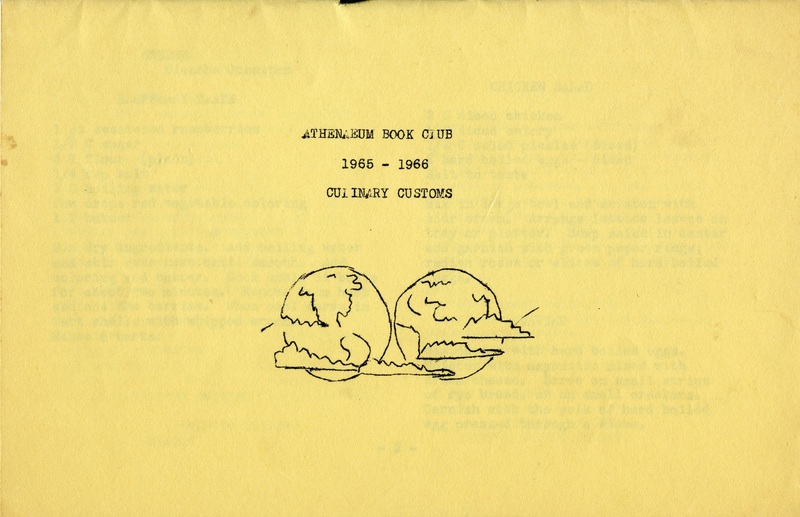 Cookbook compiled from Athenaeum Book Club members’ recipes for the 1965 – 1966 year. According to book club minutes, members chose to make dishes reminiscent of “China, Persia, Mexico, Holland, South Africa, India, Ireland, Russia, Sweden, France, Pakistan, Hawaii, and Lebanon.” Each member was also expected to bring a dish from the country or region to the club’s Christmas party. Minutes also show that each book club meeting usually included some sort of presentation on region chosen, either by the book club member hosting or by an invited guest. While I’m not an expert on cooking by any means, my impression of the cookbook was that the recipes were more “inspired by” than necessarily accurate to the regional cuisine chosen by each member – recipes may have been clipped or adapted from magazines or other cookbooks, which was common practice. 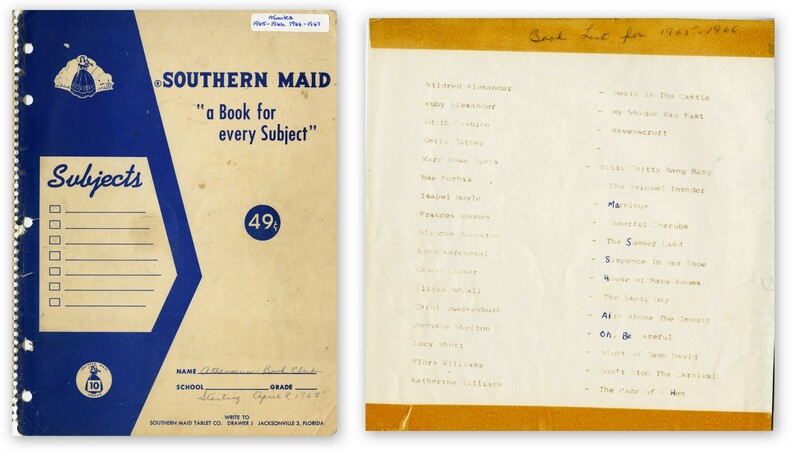 The cover of the notebook used for recording minutes for the 1965-66 year of meetings, and the book list showing each member’s selection for their first book. Ruby Alexander was a member of the Athenaeum Book Club from 1965 until at least 2013. Information on Ruby is sparse – from book club programs I was able to gather that another member of the club was her mother-in-law, Mildred Cashion Alexander (1917 – 2012). Mildred was also a long-time member of the Athenaeum Club, beginning in the early 1950s and continuing to be active until her death in 2012. Mildred was married to James B. Alexander, Sr., who graduated from Davidson College in 1938 and started the Alexander Trucking Company in town. Ruby married their son, James B. Alexander, Jr., although I couldn’t find anything more in our records on Ruby specifically. However, James B., Jr. and Ruby Alexander are still residents of Davidson. Ruby chose Pakistan as her theme for the Athenaeum Book Club’s cookbook. I chose Ruby’s “Potato Poories” because I was intrigued by the recipe – in the cookbook, it includes the subtitle “Delicious deep-fat bread rounds, greasy fingers, but so good you’ll lick them.” That sounded pretty good to me, and as we have a new staff member starting today (Alison Bradley, our new Collection Development Librarian), I decided to make “potato poories” for her welcome party. Ruby Alexander’s “potato poories” recipe. 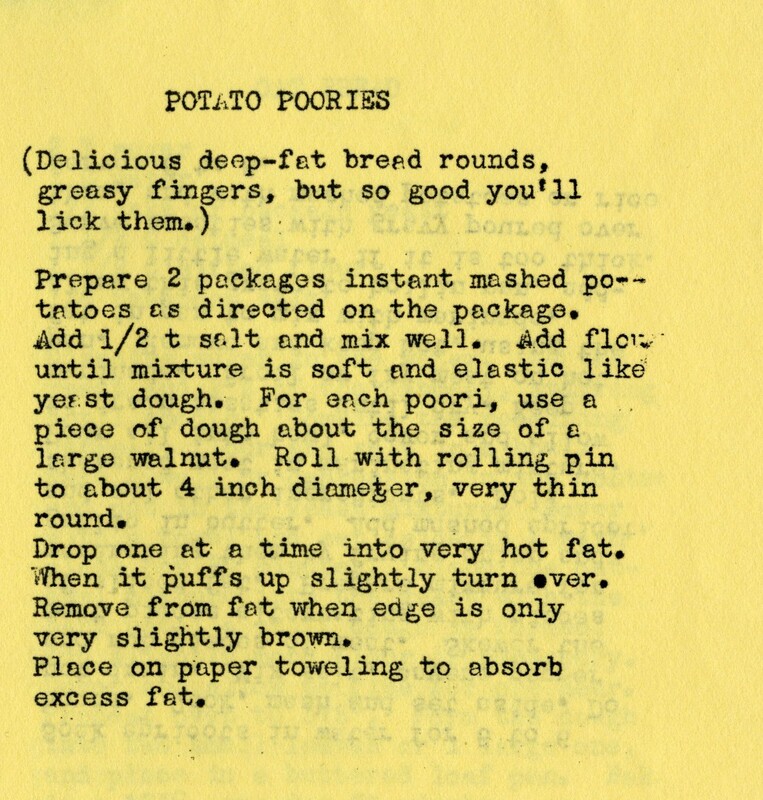 Making the “potato poories” turned out to be more of a logistical challenge than many of the recipes I’ve made from our archival collections before. Because they’re fried, I couldn’t follow my usual routine of making the recipe at home and bringing the resulting treats into work the next day. My coworker Jan Blodgett suggested I fry the poories at work, using a fondue pot. I made the called-for two packages of instant mashed potatoes at home, combined with flour, prepared the dough patties and stored them in the fridge overnight. Then, this morning, I fried the patties in our staff break room in the fondue pot. Left: fondue frying setup (thanks to Davidson College’s Technical Director/Scenographer Neil Reda for letting us borrow one of his fondue pots!). Right: the finished product. I have no idea what the consistency of yeast dough is. Ruby’s recipe did not specify an amount of flour; rather, flour is added to the mashed potatoes “until mixture is soft and elastic like yeast dough.” I’ve never made bread, so I basically added flour until the consistency seemed different than regular old mashed potatoes. Since my “potato poories” never floated on top of the oil – they were too dense – I think I needed to add much, much more flour to this mixture. If you’re going to prep patties of dough the night before, you should use bakery release or parchment paper to separate the patties. I used tinfoil because I didn’t have baking parchment at home, and removing the patties was a gigantic pain – many of my “poories” were oddly shaped because of this. An electric fondue pot is actually a really great option for stove top frying. Because the sides are high, I didn’t have any issues with oil spatter, and the pot may have been hotter than using a pan on top of a stove. I would definitely recommend a fondue pot for all of your home frying needs! While my “potato poories” may have been different than both Ruby Alexander’s and a Pakistani puri, it was still very delicious! 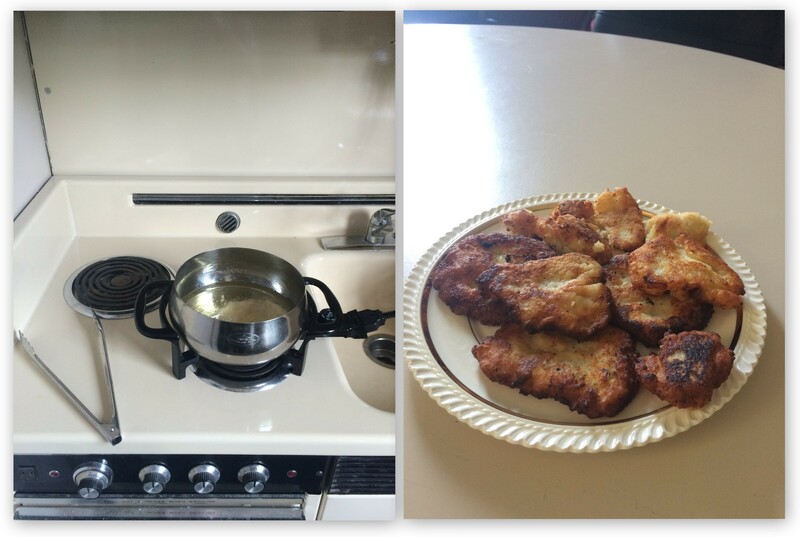 I would make these again, perhaps just as a potato pancake, and experiment with adding more ingredients.